Columbia University Press, 9780231186025, 488pp. Today, any kid can rattle off the names of dozens of dinosaurs. But it took centuries of scientific effort--and a lot of luck--to discover and establish the diversity of dinosaur species we now know. How did we learn that Triceratops had three horns? Why don't many paleontologists consider Brontosaurus a valid species? What convinced scientists that modern birds are relatives of ancient Velociraptor? 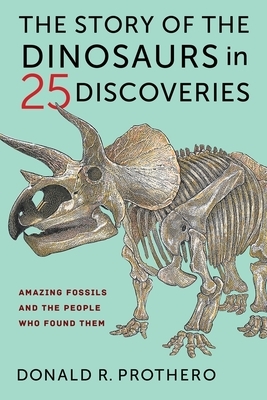 In The Story of the Dinosaurs in 25 Discoveries, Donald R. Prothero tells the fascinating stories behind the most important fossil finds and the intrepid researchers who unearthed them. In twenty-five vivid vignettes, he weaves together dramatic tales of dinosaur discoveries with what modern science now knows about the species to which they belong. Prothero takes us from eighteenth-century sightings of colossal bones taken for biblical giants through recent discoveries of enormous predators even larger than Tyrannosaurus. He recounts the escapades of the larger-than-life personalities who made modern paleontology, including scientific rivalries like the nineteenth-century "Bone Wars." Prothero also details how to draw the boundaries between species and explores debates such as whether dinosaurs had feathers, explaining the findings that settled them or keep them going. Throughout, he offers a clear and rigorous look at what paleontologists consider sound interpretation of evidence. An essential read for any dinosaur lover, this book teaches us to see an ancient world ruled by giant majestic creatures anew. Donald R. Prothero is a paleontology and geology researcher, teacher, and author. He is adjunct professor of geological sciences at California State Polytechnic University, Pomona, and research associate in vertebrate paleontology at the Natural History Museum of Los Angeles County. His Columbia University Press books include The Story of Life in 25 Fossils: Tales of Intrepid Fossil Hunters and the Wonders of Evolution (2015) and The Story of the Earth in 25 Rocks: Tales of Important Geological Puzzles and the People Who Solved Them (2018).